You don’t have to be insane or dumb to drink Starbucks coffee, but you might want to stop thinking for a few minutes if you’re trying to make sense of their environmentally-conscious (or unconscious in this case) efforts to reduce single-use plastic situations. 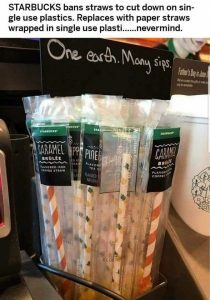 Before you cast judgment though, this is not a one-time mistake or misrepresentation of a mission for conservation, because Starbucks isn’t just replacing plastic straws with extra heavy plastic lids, but they’re replacing plastic single straws with paper straws sold in plastic wrappers that use MORE plastic than the single plastic straw did. If your brain is aching right now, that’s because Starbucks isn’t catering to you, but to their usual Leftists who like vying for causes that make no sense at all. While certain businesses (and even U.S. cities) move to ban plastic straws and plastic utensils (and also make them illegal), nobody’s considering the billions of plastic water bottles sold by those same polluting propagandists. You see, the “War on Straws” is not based on facts or even sensibility; it’s based on emotion and petty thinking. This supports the irrational “idealism” of the far Left, a cabal of hypocritical intolerant Millennials who only support causes that fit their immediate gratification lifestyles, but pay no mind to common sense, safety, important laws, and the big picture in general. 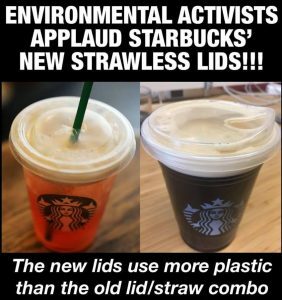 Quick, run to Starbucks and buy a sugar-laden customized frappuccino and celebrate conserving plastic while using a plastic lid that wastes even more plastic. Then, buy your kids a couple fancy flavored paper straws to “save” even more plastic – yes, the ones wrapped in enough plastic to make 10 plastic straws. Then, on your way out of the store, be sure not to trip on the homeless guy sleeping by the door, who won’t be kicked out because it’s Starbucks policy. Believe it or not, the city of Seattle just imposed our country’s first ban on plastic straws. Starbucks is leading the charge, so expect more hypocritical corporate robber-barons to follow suit. The best part of the new sippy-cup style lid at Starbucks is that it contains 4.11 grams of plastic, where the old lid and straw combo only contained 3.55 grams of plastic. Way to conserve! That’s like running over a family of ducks in the road in your rush to get your sugar fix at Starbucks while driving your car that brandishes a “save the dolphins” bumper sticker. If you fall for one hoax this decade, you might as well fall for all of them. To be anti-Trump is “hip” for the brainwashed, spoiled, fake hippies (with Mommy and Daddy’s credit cards in their wallets and purses) who drink over-priced, luxury cafe mochas, lattes, and the “Americano.” To support “liberalism” while being completely intolerant of differing opinions and throwing temper tantrums if someone walks into Starbucks wearing a MAGA hat or t-shirt is quite typical of this recent generation of “activists” who are complete hypocrites. Consumers falling for the Starbucks Ponzi scheme of investing in conservation efforts that literally pollute the Earth even more are the same “consumers” of fake news CNN and the socialism movement (that’s really a communist front). Regulars at Starbucks are giving their money to a corporation with 28,000 stores worldwide that sell Ethos brand bottled water by the thousands daily. Do you really think if you support the plastic straw ban that you’re helping anybody with anything anywhere? Ready to join the “Straw-less in Seattle” campaign? While Starbucks claims they’re saving our oceans from the pollution caused by single-use plastic straws, have you ever wondered where all the garbage from Starbucks’ plastic juice bottles and plastic water bottles ends up? If you’re really concerned about the environment, tune into GMO.news for updates on how pesticides and GMOs are polluting our world. Meanwhile, the whole “War on Straws” (and plastic utensils) is really just a litmus test to see how many morons are completely brain-washable, so Starbucks, Facebook and Twitter can track your smart phone locations and posts and advertise some socialist political propaganda this fall, in order to support another “New World Order” led by the crooked Clintons, George Soros, and Obumma. Beware.